Thanks for stopping by the Bozard Ford Lincoln site! As lifelong members of the Palm Coast community and the area's most respected provider of great new and used Ford vehicles, we understand completely why living in this city truly is all about enjoying a little slice of paradise. From getting out and taking in a little sunshine and fresh air as you play the back nine at Hammock Dunes with your favorite golf foursome to soaking up the atmosphere (and partaking in the delicious food) of the European Village, there is clearly no shortage of ways to get out and make the most of your time in Palm Coast. Of course, nothing beats the history and heritage found here. Whether you are spending the afternoon with the family exploring the vibrant scenery found within the 1500 pristine acres of Princess Place Preserve (a landmark which is also home to Florida's first in-ground swimming pool) or gazing upon the gallery of driftwood sculpture created by Patrick Williams, it is plain to see that immersing yourself in the unique culture and community story of Palm Coast is as easy as opening your front door. As you can probably tell by now, the team here at Bozard Ford Lincoln loves all that Palm Coast has to offer, so it should come as no surprise to find out that we would be honored to help the fine people of this area drive home in the right Ford vehicle that fits their unique needs. With this in mind, please join us as we bring you up to speed on all that Bozard Ford Lincoln has to offer to you and the rest of our friends located in the Palm Coast region. Are you in the market for a dependable — and affordable — new Ford car, truck, or sport utility vehicle (SUV)? Then there is no denying that Bozard Ford Lincoln has exactly what you are looking for in your next vehicle purchase. From the F-150, America's favorite truck for 40 years running, to the stylish new Escape, our expansive inventory offers up access to all of the latest models to roll off the Ford factory floor. While the F-150 might be designed to own work, there is so much more to driving one than just having access to a military-grade aluminum alloy body, 12,200 pounds of tow rating, and a plethora of other industry-leading performance features. Specifically, the Ford F-150, with available SYNC and MyFord Touch smart truck systems, also knows what it takes to go above and beyond as a leading connected and tech-friendly truck in the 21st century. Driving a Ford Fusion sends a clear message to the rest of Palm Coast. In particular, that you expect nothing but the best when it comes to sedans and your daily driving experience. Of course, when you have access to the overabundance of amenities found within this vehicle (including in-car WiFi and the ability to tap into the SYNC smart car system), sending this message simply becomes second nature. Looking for the perfect SUV to get the most out of your daily routine — and your next family excursion? Then the Ford Escape is the clear-cut choice for you. Thanks to seating for five, Auto Start-Stop technology, Ford's Blind Spot Warning system, and a hefty amount of other safety, performance, and comfort features, you can take confidence in the fact that the Escape is more than willing to handle any adventure that comes your way. The best part about shopping at Bozard Ford Lincoln? Regardless of which specific new Ford vehicle piques your interest, you can trust in the fact that walking through our front doors means having access to the not only the best selection of great Ford models, but also the best pricing and financing options in the Palm Coast area. For our friends out there who are more interested in considering used vehicles to meet their transportation needs, we want to make one thing profusely clear: Bozard Ford Lincoln is Palm Coast's home for the widest array of high quality used vehicles. From Certified Pre-Owned Fords and the ironclad assurances and protections that come with these premium selections to a cavalcade of cars, trucks, and SUVs from other automakers, the right used car for you is most certainly waiting at Bozard Ford Lincoln. 172 point vehicle inspection performed by factory-trained Ford technicians. Qualified buyers receive access to special financing offers. Complimentary roadside assistance that travels with you 24 hours a day, seven days a week. The moral of the story here? Whether you are in the market for a used car, truck, or SUV from another manufacturer or you have your eyes set on a loaded Certified Pre-Owned vehicle from Ford, you can take comfort in the fact that our copious selection of pre-owned automobiles has exactly what you are looking for in your next purchase. 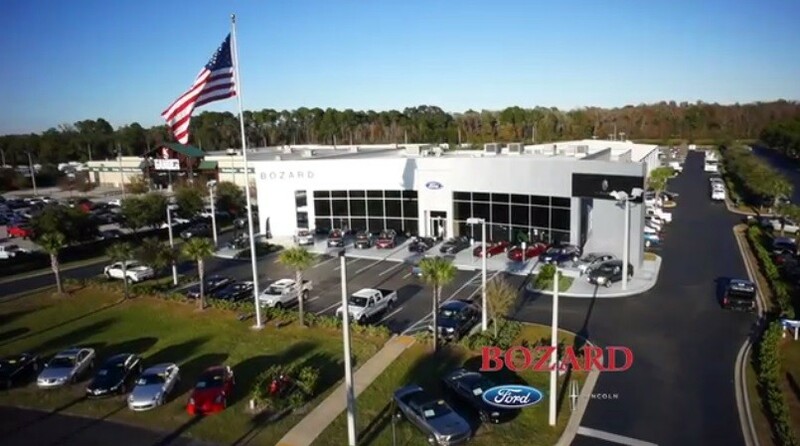 While other dealerships in Palm Coast might play the traditional game of trying to force you into a rushed or hurried sale with aggressive and slimy tactics, the team here at Bozard Ford Lincoln has a different way of doing things. Specifically, we make it a point to always put your needs first and ensure that you get the most out of your shopping experience. This means that you are more than welcome to drop in at our location and spend as much time as you need sorting through each and every one of the vehicles that stand out to you. Only when you are ready to take the next step — or simply learn a little more about the car, truck, or SUV that is on your radar — will our team of dedicated and trusted Ford experts step in and offer up their guidance and support. In other words: From start to finish, you are in complete control of the hassle-free and enjoyable car buying experience found here at Bozard Ford Lincoln. How Do I Get to Bozard Ford Lincoln from Palm Coast? To make your way over to Bozard Ford Lincoln from Palm Coast, simply hop onto I-95 North. From here, you will want to keep heading north until you reach exit 318. Once you get off of the highway at this exit, turn right onto FL-16 East and then continue on until you hit Outlet Mall Blvd. After hanging a left at Outlet Mall Blvd, follow along for a little under one mile and you will find yourself staring down the front doors of Bozard Ford Lincoln. Now that you are all caught up on what Bozard Ford Lincoln has to offer to the people of Palm Coast, as well as how best to make your way to our state of the art location, we hope to see you soon and help you get to know the Ford car, truck, or SUV that fits perfectly into your daily drive.